This sterling silver teapot arrived with the ebony insulators broken. You can see this in the close up images. In this coffeepot, I used either black Delrin, a tough industrial plastic. Carving new insulators takes a tremendous amount of time. Each insulator needs to be hand carved. The larger image shows the new insulators with the handle attached properly. This sterling teapot is restored after very serious damage during a fire. The worst problem was that the sterling teapot fell and the lid was stepped on during the fire. In addition the side was also dented, and the tip of the spout was damaged. It took great skill and three weeks to repair this teapot. I like to work on such difficult repairs very slowly as it can be very challenging to fix a lid that is stepped on. The damaged spout and dent on the side are more common repairs. 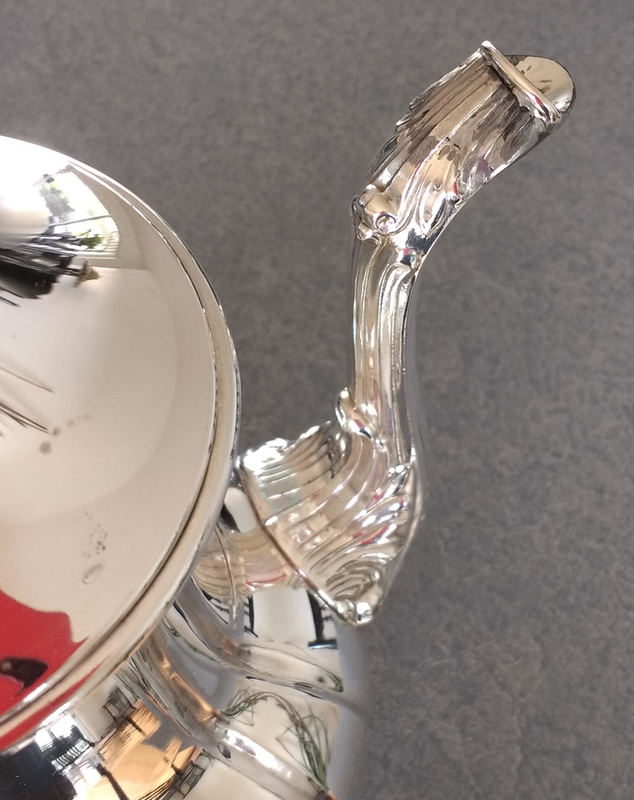 The restoration of this sterling silver teapot turned out so well that it is impossible to tell that it was ever repaired. 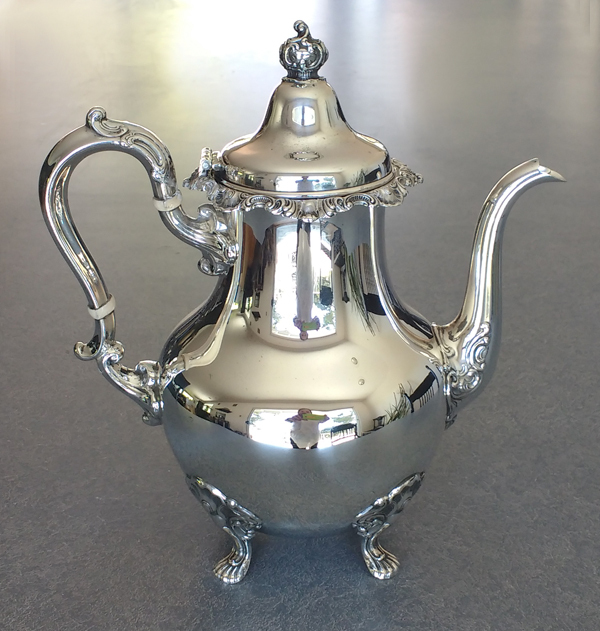 This sterling silver 19th-century teapot had a couple of dents, and the handle was "wiggly." The goal was to preserve the original ivory insulators as the customer was not intending to use this coffeepot except as decoration. The rivets in the ivory insulators were poorly done in a previous repair using a brass wire and steel wire instead of sterling. Two of the pins into the ivory insulator were missing. I drilled out the old brass and steel pins which is really challenging. Then I replaced all four pins into the ivory insulators with sterling silver wire. 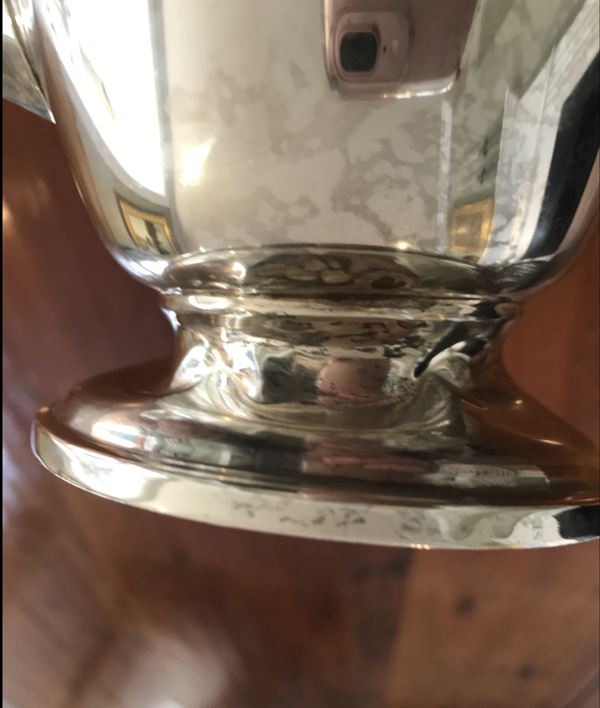 The dents in this coffeepot were carefully removed with skill, patience and strength. I never hammer dents, but push them out from the inside. Finally the coffeepot was lightly polished. The handles of silver plate coffeepots and teapots often break off at the insulators. My goal is to preserve the silverplating while repairing the handle at the insulator using sterling silver sheet. This silverplate teapot arrived with the knob broken off the lid, and the hinge was broken as well. That was a pretty easy straight forward repair. The real challenge was that the tip of the spout was broken off into about five separate little broken pieces. In the right photo you can see that that spout is back together. I fused the separate pieces back together and carved the rebuilt spout to camouflage the extensive reassembly effort. Then I added a sterling silver wire at the edge to strengthen and unify the appearance. Since I don't do any silver plating the repair does show because the solder is a slightly different color, otherwise, the repairs turned out very well. This coffeepot has a lot of sentimental value that can not be replaced. 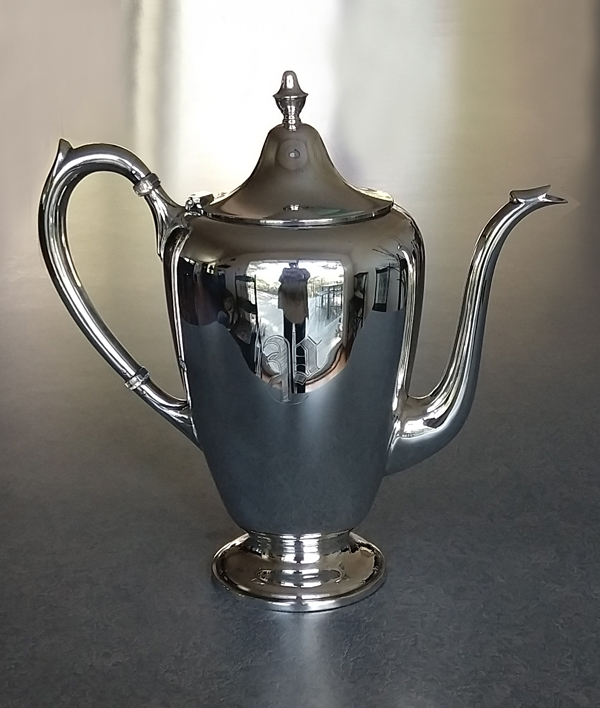 The customer said, "I received the teapot in excellent condition and wanted to thank you again for the excellent repair work and customer service you provided. I am so pleased to have my mom's piece back and restored to near perfection. You truly are a skilled artist and silversmith." This Art Deco urn was brought in for repair because the spout had broken off. 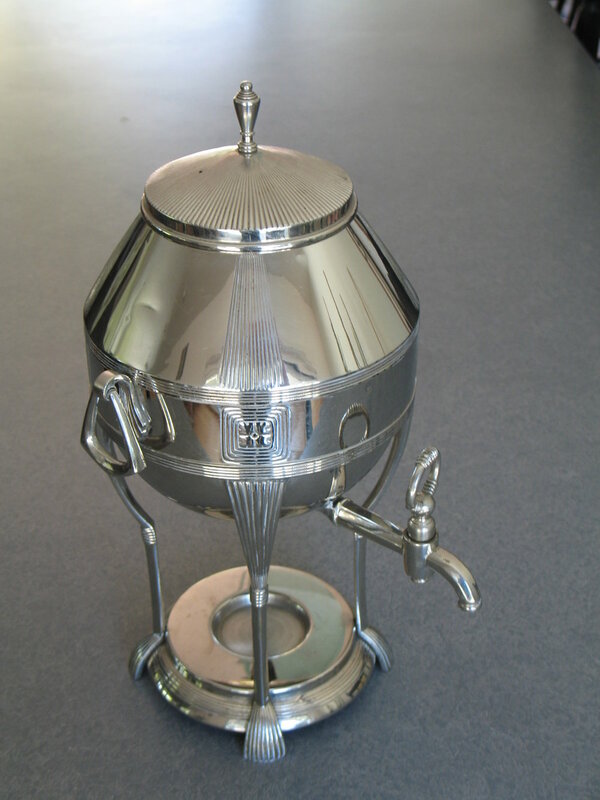 This urn is probably an Art Deco (circa 1930 -1932) piece judging from its design and the nickel plate finish. Working carefully to avoid damaging the nickel plating, I was able to repair the spigot. Nickel plate can be polished very nicely by hand with Simichrome All Metal Polish and a soft cloth. Use Q-tips to get into the corners and edges. CAUTION: Do not use Simichrome Polish on silverplate items.